This week we plan to migrate the current Open Beta to the Release version. We've put this off for the past two weeks as we worked on some Hornet and other items. 1- GBU-10, 12, and 16 laser-guided bombs with off-board designation. 2- Bullseye (A/A Waypoint) and BRA indications. 3- Improved IR Maverick axis slew and other Maverick fixes/additions like improved ship attack, longer ship lock ranges, range indications when slaved, and others. 5- New radar defaults based on SME feedback. 6- Fixed cockpit art like left DDI error. 7- JHMCS updates like look-up reticles. 9- Fixed ACM HUD mode indications. 10- L&S target heading on attack format. I'll have some Bulls/BRA and LGB videos coming by the weekend. In parallel, the team is hard at work on the HARM, datalink (SA page, MIDS, Link-16), FLIR rendering tech, and A/G rendering tech. All of this will be part of 2.5.4. 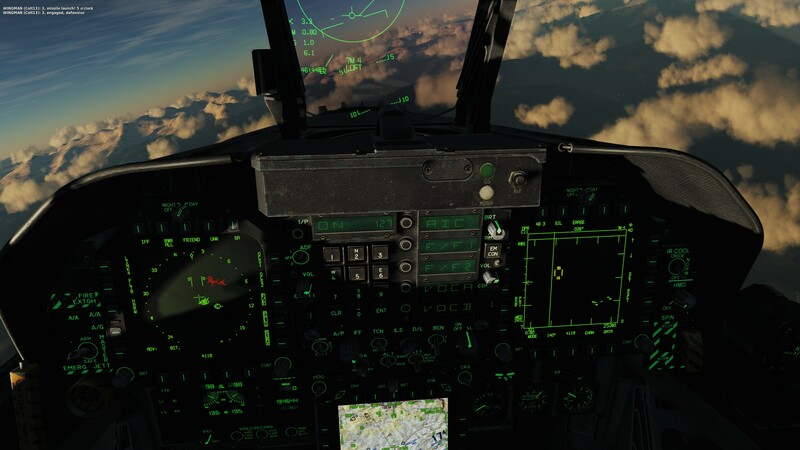 Chief, I have the Hornet and it is simply spectacular as is the Harrier and most of the other modules (I have nothing but Jets in DCS, the F-5E, Mig-21, F-86, Mig-15, Viggen, Mig-29, SU-27, SU-33, F-15C, SU-25, A-10A, freeware A-4E, and MB339). I also have the Nevada and Persian Gulf maps. For me, nothing beats the combined dynamics of DCS in terms of feel, visuals, and systems depth for fighter/high performance models. I still use P3Dv4 for heavies, etc but I tend to gravitate to DCS more these days. Eventually I will get the Tomcat but for now, I have my hands full with the Hornet. NC, as with you I do like anything with a true tailhook on it, but after getting back into DCS with the new cpu, it's been a blast around the boat with the Hornet. I'm a Tomcat fan, so it's pre-ordered and waiting, but the other modules lend more immersion for me regarding Storm's post than what I can get out of P3D, more tweaking I'm sure. I've got photoreal for Nellis in P3D, but the DCS map just needs some heat added and you're in Vegas! The recent freeware A-4 is fun, and I would get an A-6 or A-7 that came out instantly. The F-5 is also good with steam gauges and I do have the Harrier, just spend more time in the F/A-18. On TrackIR for now as I decide on VR, but very enjoyable. Data Link / MSI, MIDS and COLOR coming to life. Much to still do though, but situational awareness will be getting a huge boost. "​n today’s Hornet mini-date, I thought I’d start talking about some of the Data Link (D/L) and Situational Awareness (SA) page fundamentals prior to release. We hope to release into the Open Beta later this month. There is a lot to take in, so let’s get started early. Naturally, there will be introduction videos, academic videos, interactive training lessons, and a manual chapter on this. Let’s talk about some of the elements:Much like the HSI, you have your TDC relation to bullseye (A/A Waypoint) in the top left corner. In the same manner, you have many of the same waypoint controls like display of the selected waypoint, bearing/distance/time to selected waypoint, and sequence options. If the selected waypoint is visible on the SA display, it appears as a circle with the waypoint number in the center, with north arrow. In the bottom left corner are your chaff and flare counters. O1 and O2 will come later. Yes, we’ll have option for 120 flares. When enabled from PB 7, yellow triangle symbols appear along the bearing to air-to-air radar emitters. These have options to be set to off, side, and ID or not. Green contacts are identified as friendly, red as hostile, and yellow as unknown. This is done through a combination of IFF and NCTR prints. There are three possible sources of data that can build the SA picture: ownship sensors, other fighters (F/F), and AWACS aircraft like E-2 and E-3 (SURV). These sources are then correlated or they can be toggled on and off from the SENSR sub-level page on PBs 13, 14, and 15. PPLI allows the location and data sharing of networked aircraft. When only ownship sensors detect a target, only the top half of the HAFU (symbol) is displayed. When only from an F/F donor, only the bottom half is displayed. If both ownship and a donor detect the same contact, then both top and bottom halves of the HAFU are displayed. Contacts only detected by a SURV donor, are smaller in size circle or diamond generally. When the TDC is assigned to the SA page (indicated as diamond in top right corner), the TDC can be slewed. When placed over a contact, its Mach and altitude in thousands of feet is displayed on either side of the TDC cursor. While hovering over a contact, additional information is displayed in the bottom right corner of the display and this can vary based on its identification. Such data can include: NCTRprint, bearing and range from ownship, bearing and range from bullseye, fuel level, callsign, etc. A small dot on the left side of a green circle indicates it is a donor to the Link-16 network and is sharing data with you. A dot in the center of the circle indicates it is a command and control (C2) asset. B, C, or D inside a contact indicates it is one of your flight wingmen. The number shown for red contacts indicates its threat ranking. More functions will be coming soon, which I’ll talk about at a later point. Please remember that this is very much work in progress and very much subject to change. Just did the current update and oddly, now DCS nor the Beta version will launch for me. I click the icon and the task manager shows the program closing after 1 second running. Urrrrrg! It's stupid stuff like this that come along every now & then that I hate about PC based softwares! I was about to jump through the hoops of using the Cleanup and Repair functions BUT I read on one of the ED forums that some folks had post update issues like I did and they identified the freeware MB-339PAN addon as the culprit. I removed it from both my DCS and Open Beta install locations and BAM! Issue resolved! Not sure what is going on with that addon and DCS but it is for some a show stopper. I had done numerous updates on my main DCS and Open Beta versions with the MB-339PAN and never had this issue before. I can live without it if needed but maybe they will fix it soon or at least figure out what's causing the issue so they can prevent this from happening with other addons. The Data Link (D/L) Situational Awareness (SA) page and new radar functions are making steady progress, so I thought I’d make another little update using images. This all very much work in progress and subject to change. The first image shows the radar format on the left DDI with Latent Track While Scan (LTWS) selected and the TDC hovering over a brick. The brick now displays the selected weapon Launch Acceptable Region (LAR) as well as target Mach (left of HAFU) and altitude in thousands of feet (right of HAFU). The next step would be to designate the target as the Launch and Steering (L&S) target and the ability to set a secondary Designated Target (DT2). Along with a hover over contact, you can get additional information up to three contacts in LTWS mode. With MSI enabled, you’ll also then have D/L information available. Once LTWS is done, then we’ll take care of Track While Scan (TWS) mode. On the right DDI is the SA page five unknown contacts at the top of the page., They are yellow because they have no ownship IFF interrogation (hover over contact and depress sensor hat switch to interrogate). The staple at the top of the HAFU indicates the player has no IFF on a target, but the lower chevrons indicate friendly donor aircraft (F/F) have set the targets as hostile. Once both the player interrogates the contact and comes back negative, then the HAFU would change to red and be a diamond. In this way, the color and top and bottom of the HAFU tell you a lot about the classification of the contact. Remember: staple = unknown, chevron = hostile, and semi-circle = friendly. Yellow = unknown, red = hostile, and green = friendly based on ownship. In the second image the left DDI now shows a target locked in STT with Non-Cooperative Target Recognition (NCTR) enabled. A successful NCTR print of the target depends on range and aspect angle into the intakes of the contact. On the right DDI we see that the target is identified as an IL-76 and the star HAFU indicates the STT L&S track. It is yellow because no ownship IFF interrogation has been made. Because the radar is in STT, it is not scanning for other targets. As such, all other contacts on the SA page are from F/F and SURV sources over the D/L. The smaller red triangles are SURV tracks from an AWACS that only the AWACS is seeing. The red lower chevrons with the dot is from a friendly donor (F/F) source. A new datalink / SA page element was added today to support for SAM threat zones. These are determined before hand and are static indications based on Mission Editor settings. If the unit is hidden it will not appear on the SA display, if it is not hidden, it will display. Just like the real system, this is NOT a dynamic indication based on RWR or any sensors. It simply alerts the pilot of a reported SAM threat that was entered in the mission file before they even took off. "Hey everyone,As mentioned in earlier posts, we are at work on a detailed Aircraft Settings capability through the Options, F/A-18C, Special Tab. This consists of two primary elements: Aircraft Systems and Mission Card. Both will allow you to pre-configure the Hornet before flight in both single and multiplayer. As such, you would be able to setup your own aircraft defaults. Aircraft Systems include all functions that are NOT specific to mission (.miz) file or Mission Computer settings. This includes such items as lights, bingo fuel, various cockpit switches, altimeter, etc. In this way, you can have your aircraft setup just that way YOU want it. The Mission Card allows you to set up software options for all missions that includes such items as radar settings, countermeasures, AG weapon programs, and navigation settings. The third element of mission configuration MUST apply directly to the specific mission file or there will conflict between Aircraft Settings and the mission file… these are the waypoint settings. As always, a mission is created with a set of waypoints and properties when the mission is created by the mission designer. For the Hornet though, we are greatly adapting this to account for a much more realistic Hornet waypoint system that accounts for up to 60 waypoints in the database, of which waypoints can be assigned properties of sequence 1, sequence 2, sequence 3, initial point, A/A waypoint, Pre-Planned (PP), or Pre-Briefed (PB). In the Mission Planner, the player would be able to then adjust these if desired on a per-mission basis. We are also looking to making the Mission Planner available in multiplayer. This will also include a new waypoint user interface that we’ll share a bit later once it is more solid. This is all deep in development and very much subject to change. We have no release time frame in mind yet… it will be released to an Open Beta once we feel it’s ready. "I’ll be talking about this much more in the next week or two, but basic JDAM is coming along well. Here is an image of the JDAM in Target Of Opportunity (TOO) mode. This will be in addition to the Pre-Planned (PP) mode. Once the the basic modes are in, we will add the dynamic launch zone indications on the HUD and HSI.In the meantime, we are shooting for (not a promise) D/L SA page and HARM TOO mode for 27 February. In parallel, LTWS, Aircraft/Mission Card, and wake turbulence are all progressing well. I will be away for the next week, so there will be no new updates until next week. Two new weapons coming to the Hornet later in early access are the GBU-24 Paveway III and GBU-32 JDAM. Here are some images of the new models. For the keen-eyed, you may notice varients in thermal protection and fuzes.